Researchers from the CNRS and the Université Libre de Bruxelles (ULB) have prepared the first global map of the distribution of atmospheric ammonia (NH3) by analyzing measurements taken by satellites between 2008 and 2016. The IASI interferometer developed by the CNES allowed them to catalog more than 200 ammonia sources, two-thirds of which had never been identified before. These sources are essentially sites of intensive livestock production and industrial activity. The team's findings are published in Nature (December 5). For the last 12 years, the IASI interferometer on board three successive Metop satellites have provided scientists with global data on various atmospheric components, including ammonia. Atmospheric ammonia merits particular attention because it breaks down into fine ammonium salt particles that degrade the quality of the air we breathe. Yet the processes regulating concentrations of this gas are still poorly understood, especially on the local scale. 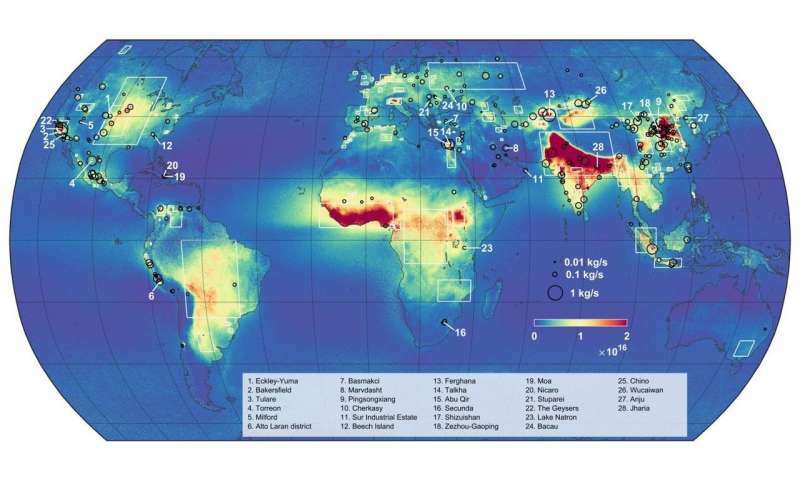 Using the daily data on ammonia levels recorded by the interferometers over a period spanning nearly ten years, the researchers generated a map of the global atmospheric distribution of ammonia whose resolution is on the order of a square kilometer. By combining their map with satellite imagery, they uncovered and categorized 241 point sources of anthropogenic NH3 emissions—83 linked to intensive livestock production and 158 to industrial activity—as well as 178 wider emission zones. (See map). In addition to recording new sources not found on current emission inventories, the study has shown that levels of emissions from previously identified sources are greatly underestimated. By observing changes in the data over time, the team was also able to trace developments of the associated human activities, like the startup or shutdown of industrial complexes or the expansion of infrastructures for intensive animal farming. These findings suggest that better management of the impact of ammonia pollution requires a comprehensive review of ammonia emissions, which are much higher than presently suggested by inventories. The articles appears to have missed the mention of harmful effects of NH3 to the environment and humans.